Baby Boomers, Generation X, Millennials, and now: Generation C.
That’s right. Keynote speaker and award-winning author Brian Solis has coined a term for the latest generation—a generation defined not by age or by decade, but by lifestyle. Generation C, where C stands for connected, is the end of business as usual and the beginning of a more personal era of business. During our latest webinar, Brian Solis discusses his exclusive Insightpool eBook and speaks with CEO Devon Wijesinghe about the shift that needs to take place in marketing and sales in order to gain the attention of this connected generation. “Generation C represents a connected society based on interests and behavior. Gen C is not an age group—it’s a way of life,” says Solis. These connected customers are growing, while traditional customers are fading away. This is not the customer that gets their news from newspapers and magazines or waits for their show to come on every week. Instead, they binge watch on-demand shows, get their news on mobile devices, and communicate through texts and tweets. Generation C possesses a sense of empowerment. Through technology, they have more control than ever, and with this control comes new expectations. These expectations demand instant gratification, personalized service, and individual attention. This is the future of engagement, and there is a big opportunity here for brands. It’s the end of business as usual and the beginning of a more human, more personal era of business. To succeed, brands must relearn what they know by thinking like the customer and bringing the experience down the personalization of each and every individual. When social media emerged, brands jumped on every network looking to reach social customers. But rather than getting to know people—why they were there, what was important to them, where value could be added—many simply used these social networks for selling and marketing. Businesses didn’t take the time to get to know people, and it’s this simple action that is now redefining the approach for Gen C. The future of sales and marketing lies in the mixing of experience design, content marketing, and SEO. Brands should strive to be more like people. When you have someone’s attention, what do you do with it? Create an experience. The next steps, the messaging, the SEO—this is where brands find humanity. When people feel like they are listened to (again, the humanity of the brand coming in to play), they take the next steps—they advocate, they influence, they make a purchase. Technology is merely an enabler for relationships—and a powerful one at that. Without understanding this technology and its relationship with behavior, without aligning a bigger mission, we are just managing businesses the way we always have. One way to look at relationship building is by mapping out the real digital customer’s journey, understanding how it works and how it’s different than the traditional customer journey. It’s then that we come to the Influence Loop. In this loop, influencers help by creating content and engaging people on your behalf (or on your competitor’s behalf), which moves people along this journey. Or, your customers are creating content and engaging others because of how they do business with you, which moves people along this loop. 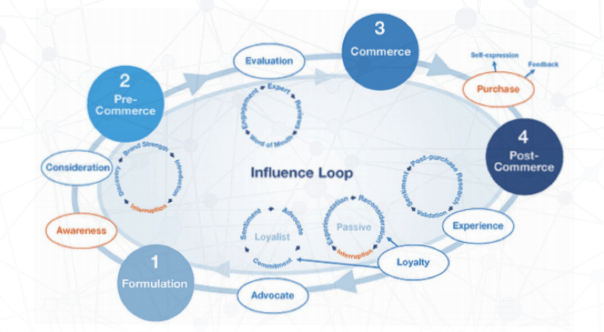 Check out the eBook for more visuals of the Influence Loop and the Customer Journey. Relationships are built on trust, and everyday consumers trust others like them. They don’t trust executives, and they don’t trust ads, but they do trust peers. To build that trust, don’t ask for the sale on your first interaction. Add value. Engage them their way. Engagement is a moment in which you provide value while someone takes value. This plants the seed of a relationships. Whether you’re informing, helping, or providing a service how they want, when they want, and where they want, all of these add value. What do you want someone to experience with your brand? You must identify your brand’s personality and make sure that it’s coming through consistently each day, on each platform. Customer’s don’t see departments—they see one brand, and you have to act like it. For the Q&A session and to hear Brian announce the name of his new book, watch the full webinar here. 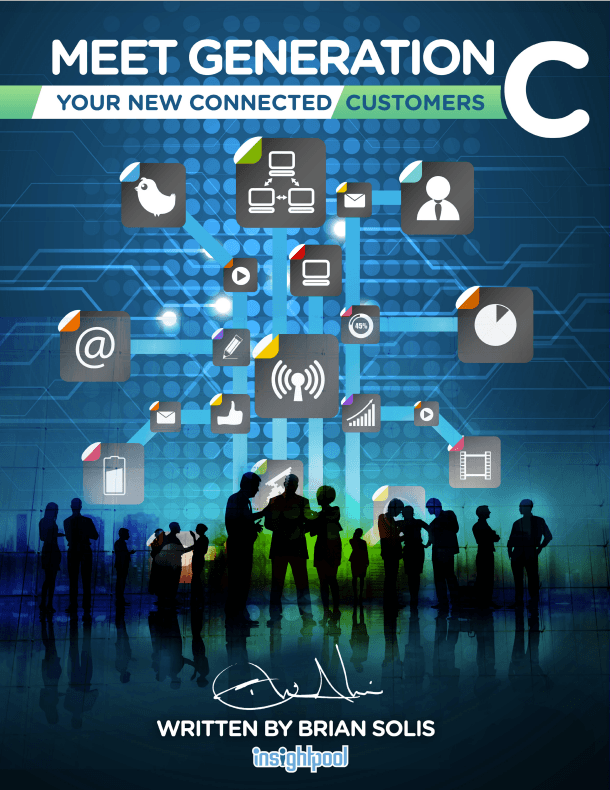 And don’t forget to download our free eBook, Meet Generation C, Your New Connected Customers.